So where do you go to get your hardwood and, softwood logs or briquettes for your wood burner if you can’t prepare them yourself? You must have seen the piles of netted logs and kindling at your local garage alongside the sacks of coal. 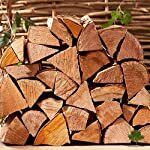 Convenient and easy yes, but the prices vary widely and keep in mind that you can burn your way through one of those nets of logs in as little as 48 hours! The same goes for the briquettes, they may feel reassuringly heavy when you pick them up, but they will soon be ash! You will see a similar situation at garden centres too, they are local, have a captive audience and can therefore price their products accordingly, beware you will most probably be paying a lot more than you need to to. Both the garden centres and garages will be buying their hardwood and softwood logs and briquettes in from a local supplier. At much lower prices than you would pay and then they will be marked up for sale. My advice to you is regard the garage or garden centre as your “emergency” source. Look for a local firewood producer first and then if you don’t have one go online to Amazon or Ebay. If you are really lucky you will have a firewood producer in your area who will happily deliver bulk loads to you at a very good price. He most probably supplies the local garages and garden centres too who then mark his prices up. 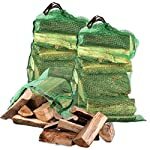 Fortunately for you a lot of firewood producers are now offering their products on line platforms like Amazon and Ebay at very competitive prices and they will deliver your softwood and hardwood logs and briquettes too. The online platforms are great for the buyer as you get a vast range of choice and for the most part convenient delivery too. 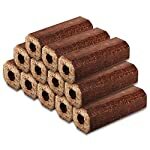 For the sellers or suppliers of the hardwood and softwood logs and the briquettes it’s cut throat. They all have to keep their prices and delivery options very competitive if they want your business.